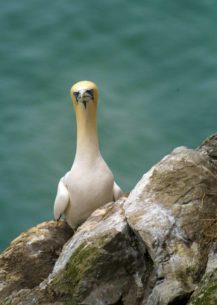 Species: Northern Gannet (Morus bassanus) Story: Ever wondered how it feels like when you have an eye to eye connection with a creature in the wild? On a second thought doesn't he look like a "Bowling pin"? Made this image on an island called the Ireland's eye. While I was birding on the edge of a cliff it was a blissful connection when I clicked the very moment this cute fella looked at me.